After three straight seasons of hosting playoff baseball in Pittsburgh the Pirates could not make it back to October in 2016. The team struggled all season long to take the next step in the National League Wild Card ultimately not even reaching the .500 mark. with 78 wins. Looking ahead to 2017 the Bucos seem to have the exact same roster as they did a year ago. The Pirates finished in the top half of the majors in runs scored at 13th. Going into 2017 the Pirates offense has potential to be even better. Star Centerfielder and former NL MVP Andrew McCutchen suffered his first real down year batting just .256 with 24 Home Runs and 79 RBI”s. If McCutchen can return to his perennial all star and MVP caliber self the Pirates are already an improved offense. The Pirates have one of baseballs best Outfields with McCutchen, Starling Marte and Gregory Polanco. Marte batted .311 last season while Polanco knocked out 22 Home Runs with 86 RBI’s. THe Pirates also still have former all star Josh Harrison, and a top prospect Josh Bell ready for his first full MLB season after batting .273 in 45 big league games in 2016. With all this talent the Pirates offense should be the strength of the team. As for the starting pitching there is reason to be concerned for Bucco fans. Ace of the staff Gerrit Cole struggled mightily in 2016 pitching to an ERA of 3.88. If he pitches like this again the Pirates have absolutely no chance to win a lot of games. 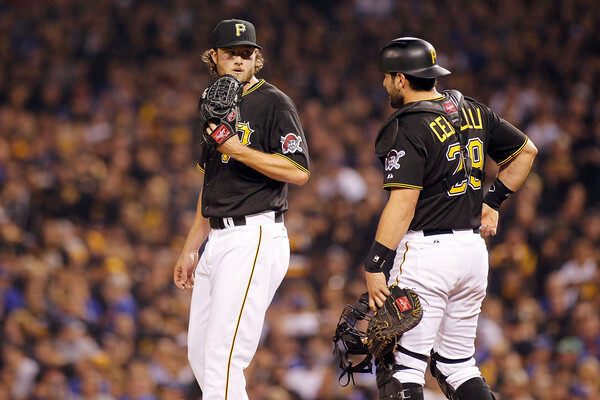 The Pirates need the 2015 All Star Cole who pitched to a 2.60 ERA to return. Ivan Nova who the Pirates got from the Yankees will be back for his first full year in Pittsburgh. He will need to be a two starter in order for the Pirates to succeed due to the young pitchers behind him. Jameson Talison once top prospect and Chad Kuhl age 24 are very young and will suffer growing pains. Ivan Nova and Gerrit Cole need to anchor this staff if no the Pirates are going to be serving up a lot of runs. As for the bullpen the Pirates finished 20th in bullpen ERA. That number is a little skewed due to the fact closer Mark Melancon was traded half way through the season. With no Melancon tony Watson a 2014 All Star will side into the closer’s role full time. He pitched to a 3.06 ERA with 15 saves in 20 opportunities in 2016. The Pirates will need newly acquired Daniel Hudson and young Felipe Rivero who was a big part of the Mark Melancon trade to Washington to step up as solid late relief options. If all three can pitch well the Pirates bullpen will be just fine. If not this Pirate bullpen with no real closer can be among the worst in baseball. All in all the Pirates are a long shot to make it back to the playoffs. The team lacks pitching depth in the rotation and bullpen and won’t be able to put up enough runs every night to win the high scoring games they’ll likely be involved in. Posted in MLB, Pittsburgh Pirates and tagged MLB, offseason, Pirates, Power Rankings.